COLUMBUS – Jason Collier, the 7-foot basketball star from Springfield who died at the age of 28 while a member of the Atlanta Hawks of the National Basketball Association, is among eight players who will be inducted by the Ohio Basketball Hall of Fame on May 5, 2018 at the Hyatt Regency in Columbus. Collier led Springfield Catholic Central High School to a state championship in 1996 before attending Indiana and Georgia Tech universities. He was about to begin his sixth professional season on Oct. 15, 2005, when he died of a “sudden heart rhythm disturbance” caused by an enlarged heart. Collier will be honored at the dinner and ceremony in Columbus next May along with 16 other individuals and six outstanding teams. The 2018 class includes former collegiate male athletes Jim Holstein of Cincinnati, John Powell of Miami, Jimmy Darrow of Bowling Green and Gary Trent of Ohio University. Women players selected were: Jessica Davenport of Ohio State, Jackie Motycka Mossing of Crestview High School and Bowling Green State University and Deb Elwer Lindeman of Delphos St. John's High School. Coaches in the class are: Charles “Red” Ash of Canton South High School, Bill Brown of Wittenberg University, Gene Ford of Muskingum University, Sue Ramsey of Ashland University and Mary Jo Huismann of Mother of Mercy High School in Cincinnati. Walt Wesley, the 6-foot-11 center, who played in the National Basketball Association for both the Cincinnati Royals and Cleveland Cavaliers, was selected from the professional ranks. The University of Dayton men's basketball teams of 1965, 1966 and 1967 will be honored, as will Ashland's 2013 national champion women's team and the back-to-back state championship teams of St. Henry High School in 1990 and 1991. Terry Wymer of North Baltimore is the basketball official in the 2018 class and John Joseph of Upper Sandusky is being honored for having developed the Shoot-A-Way and Gun ball-return devices used by thousands of coaches throughout the country and the world. 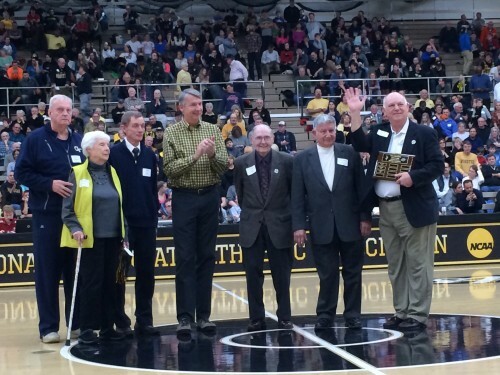 Holstein played on the 1948 Hamilton Catholic High School team that was runner-up in the Ohio High School tournament with a 27-2 record. He led the University of Cincinnati Bearcats in scoring three straight years and played four years in the NBA with Minneapolis and Fort Wayne before becoming head coach at St. Joseph's (Ind.) College and Ball State University. He died in 2007. Powell, a graduate of Franklin High School, had a stellar career as a guard at Miami University. He scored 1,106 points over three seasons – two in which Miami played in the NCAA Tournament. He averaged 15 points per game each season with a high of 15.9 in 1956-57, when he was a first-team All-Mid-American Conference choice. On Dec. 18, 1957, he scored 43 points at Marshall, which is still tied for the third best single-game output in Miami history. Darrow was a 5-foot-10, 170-pound guard who brought attention to Bowling Green State University with his amazing scoring ability. He scored 52 points in a game twice in the 1959-60 season. A product of Akron South High School, he led BG in scoring three straight years and was the first Falcon to make the All-Mid-America Conference team three times. He scored 1,740 points, averaging 24.2 points over his career. He was second only to Cincinnati's Oscar Robertson in 1960. 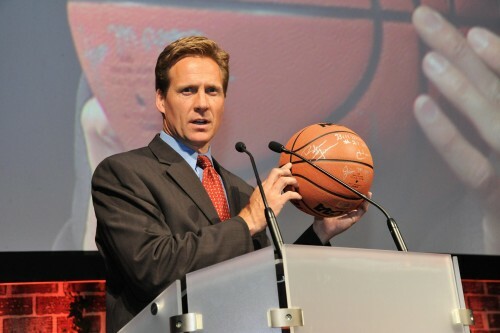 Trent is considered by many to have been the best basketball player in the history of Ohio University. A muscular 6-foot-8, 250-pounder, he played three years at OU and was the only player in Mid-American Conference history to be voted Player of the Year in his first three years. Selected 11th overall in the 1995 NBA draft, he played 10 years in the league, with stints in Portland, Toronto, Dallas, and Minnesota. He also played pro ball overseas for three years. Trent attended Hamilton Township High School in Columbus. Davenport, a 6-foot-5 center, was a three-time Big Ten Conference Player of the Year at Ohio State University where she led the Buckeyes to three straight Big Ten championships. She also was a member of the United States women's national team in 2005 and 2006, while at OSU, and in 2007 and 2008, while a member of the New York Liberty team in the WNBA. A graduate of Independence High School in Columbus, Davenport was the second player selected in the 2007 WNBA draft. Jackie Motycka, who grew up in Convoy, Ohio, was the all-time leading scorer and rebounder at Crestview High School, collecting 1,742 points before graduating in 1985. That was not long after leading the Lady Knights (24-2) to the state Class A semifinals. Then she led Bowling Green State University to three consecutive Mid-American Conference championships and was Player of the Year twice. She had career averages of 18.1 points and 6.8 rebounds. Deb Elwer was known as “Miss Clutch” at Delphos St. John's High School. She led the girls basketball team on three straight trips to the state high school tournament and a 74-1 record. The 5-foot-10 forward was UPI Ohio Class AA Player of the Year in 1978 and 1979. The Bluejays won the Class A championship in 1977 with a 61-40 victory over Mansfield St. Peter and the Class AA title in 1979 by beating Bishop Hartley of Columbus, 57-53. Their only loss was to Springboro in a 1978 Class AA semifinal. ”Red” Ash was one of Stark County's most colorful coaches during a 37-year tenure at Canton South High School. He was also one of the most successful as evidenced by his 634-200 won-lost record. When he retired he was the winningest coach in Ohio. His 1948 team reached the final four after winning two regional games by a combined 99-45 points. Brown had some tough acts to follow at Wittenberg where Ray Mears, Eldon Miller, Bob Hamilton, Larry Hunter and Dan Hipsher preceded him as head coach, but he lasted 23 years and left a strong legacy. His first team won 30 games in 1993-94 and he had another 30-game winner in 2005-06 when the Tigers advanced to the NCAA Division III championship game only to lose a heartbreaker to Virginia Wesleyan. His record was 483-167 for a .743 winning percentage. Ford was a 5-foot-8 guard who averaged 27.6 points as a senior at Indian Valley North High School in 1969-70 while earning a spot on the Class A All-Ohio first team. After scoring 1,310 career points, he moved to Muskingum College where he earned four letters and scored 1,717 points – second most in school history. He was “Athlete of the Year” in the Ohio Athletic Conference and made UPI's “Small America” squad. As a coach at Cambridge High School for 25 years (1980-2005) his teams won 400 games and lost 83. Ramsey spent much of her time in Division I basketball. After becoming the first woman to get a basketball scholarship at Indiana University, she transferred to Miami University for her senior year. She was an assistant at Illinois State, Miami and Cincinnati before becoming head coach at the University of Dayton where she had a 95-128 record in eight seasons. Real success was just around the corner. She took the head coaching job at Ashland University and her teams had a 501-364 record over 20 years, The highlight was a Division II national championship in 2013, after being runner-up in 2012. 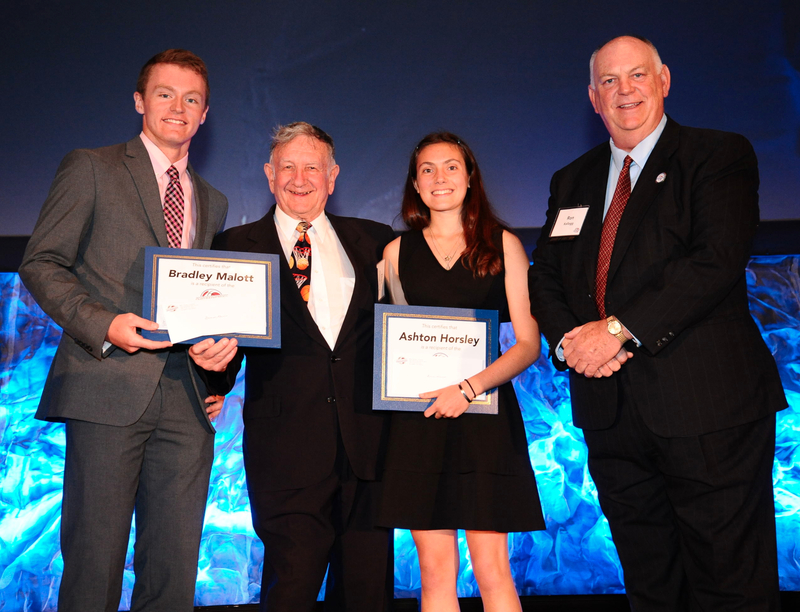 Huismann, head basketball coach for 44 years at Mother of Mercy High School in Cincinnati, has had a remarkable record of leadership that extends far beyond her 672-315 record at the school. She has conducted basketball camps for grade school girls for 41 years. She organized Cincinnati's first summer league in the 1980s, and it grew to support 500 participants. Mother of Mercy named its gym floor for her following her 500th victory and the school's annual golf outing was given her name after her 600th win. During 39 years as the school's athletic director she was instrumental in the development of 11 sports programs with 22 teams. Wesley, an All-American at Kansas University, was selected by Cincinnati in the 1966 NBA draft and played three seasons for the Royals as a backup for Jerry Lucas and Connie Dierking at center. He was traded to Chicago and played one season for the Bulls before going to Cleveland in the expansion draft. In the Cavaliers' first two seasons he started every game at center. He had a 50-point game against the Royals. He was traded to Phoenix early in the 1972-73 season. The University of Dayton men's basketball team made three straight NCAA Tournament appearances from 1965-67. The Flyers were eliminated by No. 1-ranked teams all three years. Led by 7-foot center Hank Finkel, the 20-6 Flyers defeated Ohio University in 1965 but lost to No. 1-ranked Michigan. In 1966, Dayton (22-4) defeated Miami University but lost to Kentucky, 86-79. In 1967, a 21-5 Dayton team led by Don May knocked off Western Kentucky, Tennessee, Virginia Tech and fourth-ranked North Carolina but lost to Lew Alcindor and the No. 1-ranked UCLA Bruins, 79-64, in the championship game. Ashland University's women's team fell one victory short of winning a Division II national championship in 2012 but grabbed the elusive title the following season. The 2012-13 Eagles had a 37-1 record, going 20-0 on their home court. Their average margin of victory was 22.4 points. The team's best player was 6-foot-1 senior Kari Daugherty, who transferred to Ashland to be closer to her home in Fresno, Ohio, after spending two years at the University of Dayton and playing well for the Division I Flyers. Daugherty scored 26 points and grabbed 12 rebounds as Ashland defeated Dowling 71-56 in the championship game. In 1990 and 1991 the huge St. Henry High School boys basketball team brought home state championships in different divisions. Coach Fran Guilbault's 1990 group defeated previously unbeaten Youngstown Liberty, 71-60, for the Division III crown. The 1991 team trounced Tri-Village of New Madison, 71-45, in the Division IV title game. The top six in St. Henry's 1990 lineup averaged 6-foot-4 and over 200 pounds. They included 6-foot-4 Pat Droesch, 6-4 Bob Hoying, 6-6 Kevin Niekamp, 6-2 Scott Brunswick, and 6-5 Terry Niekamp with 6-4 Scott Heitkamp coming off the bench. Only Droesch and Terry Niekamp graduated that year, so the Redskins were loaded again in 1991. 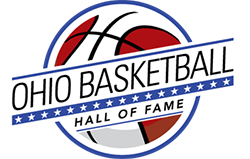 Founded in 2006, the Ohio Basketball Hall of Fame recognizes the achievements of both male and female basketball players in high school, college and professional basketball; successful coaches on all levels; and those who have impacted the game along the way. 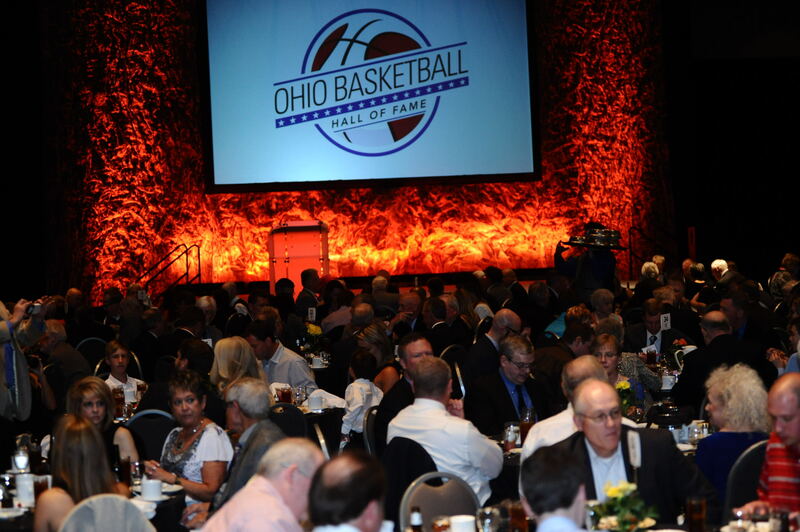 The induction ceremony is a celebration of basketball, its rich history, and those who have contributed to the game in Ohio.